What to wear with red this winter and spring (hint: not black or white). *Updated February 18th, 2019* Happy Valentine’s Day! Are you celebrating today? I spent last night making Valentine’s treat bags and choosing bathroom tiles with my best gal (who’s seven and looks a lot like me). I guess that means that I celebrated Galentine’s Day. Today, however, feels like an ordinary day, as my husband and I don’t really celebrate Valentine’s Day. Somehow though, I have a desperate urge to wear red! Some color psychologists suggest that red evokes emotions of passion, power, love, and energy in everyone. Others argue that our reaction to color is based on our culture and experience. In South Asia, red is the color of marriage. If you live in South Africa, you may consider it the color of mourning. In the Middle East, it is often associated with evil. Here in the U.S., it is the color of love, caution, and patriotism. Having lived in a few different countries and states, I agree with the latter group of psychologists, that colors can stir up different emotions at different times. Growing up in Aisa, red was my special occasion, good luck color. During college at U.C. Berkley, I couldn’t wear it without feeling guilty (It was our rival school’s color.) Here on the farm, we are surrounded by century-old red barns, so it is now the color I associate with tradition and home. After taking stock of my clothing a few months ago, one of my goals was to incorporate color back into my mostly neutral closet, one of those colors being red. I often wear it with classic combinations, such as black and gold, or denim and white. This month, I’m challenging myself to wear it with other colors. 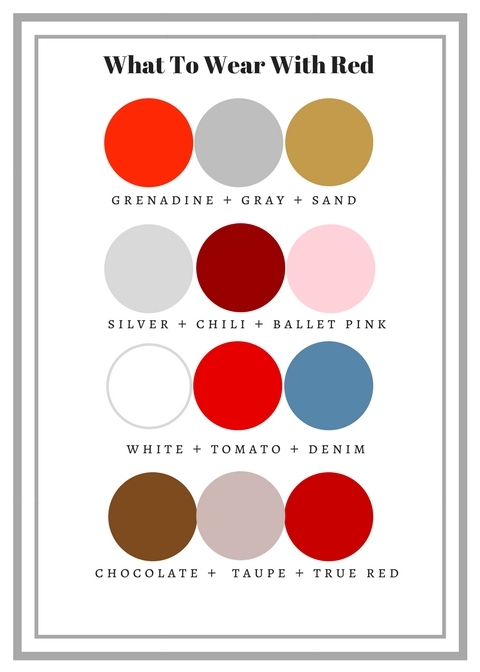 I created this chart for inspiration, using some of the colors from the fall/winter collections, as well as what’s in store for us this spring. This Baobab Cat Hermès scarf incorporates some beautiful shades of green and blue. This Leyla printed skirt from Anthropologie is fun and flirty. If you’re looking for something under $30 take a look at this printed sweatshirt from Zara. Do you have a favorite combination including red? Feel free to comment below. If you need more inspiration, take a look at this Pinterest board. Pingback: How do you add a little spring to your closet when it's still freezing outside?